With human lives sometimes at stake, quality, reliability and repeatability are critical to the production of medical products. Whether your processes involve CNC machining or handling robots the same exacting standards always apply. Built around the world’s most reliable CNC, every FANUC solution has been designed specifically to meet these requirements by delivering maximum precision and incredible repeatable accuracy. What is more, because manufacturing medical products often pose challenges, such as gas and viscosity issues affecting transparent moulded items in injection moulding or wire breakages slowing down the production of precision instruments using thin wire EDM, FANUC has developed a wide variety of solutions specifically designed to resolve these problems. The result is not only extremely high levels of repeatability but also improved cycle times, better productivity and lower operating costs. "In FANUC we definitely have a reliable expert partner"
Optimise your value chain right from the very start of the production process using FANUC front-of-line automation. Depalletising, loading, line charging or thermo forming your packaging – many tasks in the medical industry can easily be automated. Taking care of the particular requirements of delicate environments we provide individual solutions for safe processes in the manufacture of medical parts. Day in, day out, robots provide a safe and reliable way of loading and unloading your machines. For the lighter payloads often found in the medical industry, the extremely dexterous LR Mate 200iC series makes an ideal choice. Equipped with iRVision and 3D Area Sensor, FANUC robots will pick, sort, place and orientate products on a moving conveyor for assembly or packing. Setting up is easy using FANUC’s handy iPendant interface with smart interference avoidance technology ensuring the robot is never off target. "For the control of our machines, we need CNC and drive systems that guarantee high performance and that we can depend on 100%. In all the years that we have been cooperating with FANUC, these requirements have been fulfilled completely. Likewise for our new MultiSwiss solution, we cooperated at a technical level in the true spirit of partnership." Producing and processing high-tech medical devices seamlessly poses a considerable challenge in the manufacturing of medical parts. Taking in everything from injection moulding, CNC machining, wire EDM to pick and place, sorting and packaging, FANUC’s tailor-made solutions make it possible to automate almost every conceivable process within the medical industry. This includes cost-effective solutions for high-precision micro products, clean room and special coating applications and much more. Needless to say, our solutions are fully compliant with hygiene regulations and clean room standards. Linear bearings are essential components of the rotary drives within various medical devices and machines. Producing them requires extremely high-levels of repeatable precision. 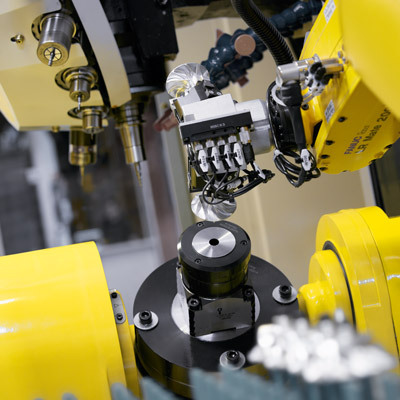 FANUC ROBODRILL is capable of machining a wide range of materials including stainless steel, aluminium, carbon and even ceramic to an incredible degree of accuracy. Production cells built around CNC machines provide a simple way of adding flexibility and cutting costs. Capable of producing every imaginable kind of plastic medical part, ROBOSHOT S-2000i/300B makes the perfect centrepiece to a cell of this kind. Benefitting from a small footprint, M-10 tending robots with their lighter payload capacities are ideally suited to tending work of this kind. With ROBOSHOT’s smart AI Metering Control function compensating for variations in viscosity consistent results are ensured whatever the process. What is more, because ROBOSHOT is equipped with 6 different screws as standard, manufacturers can easily alter production to accommodate different types of product. In the medical industry ensuring high standards of quality provides the key to success. CNC machining high-precision medical devices such as components for pumps, not only ensures repeatable precision but guarantees quality by reducing defective parts to close to zero. FANUC's high-precision cutting systems are capable of producing the most incredible shapes and structures. 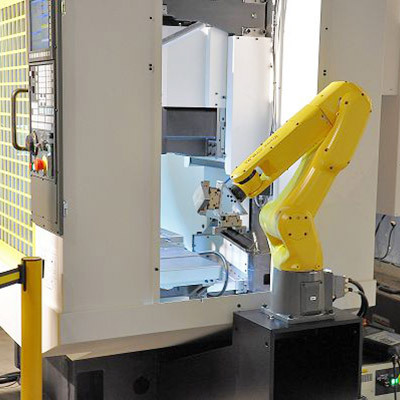 Setting new standards in precision, FANUC's 31iB CNC is ideally suited to these applications. Combined with FANUC's ALPHA i servo motors and integrated PMC and I/O Link, it delivers the ultimate in speed and accuracy. For full transparency and superior quality management, ROBOSHOT comes with up to 16 multi cavity pressure channels, cavity balance monitoring and historical data collection. To save money, ensure easier operation and minimise external components, monitoring is done via the CNC. You just select the required part quality. Equipped with vision systems, delta robots are the perfect choice for picking, sorting, inspecting, placing and inserting parts. This can be done at high speed on moving conveyors. Clean room robots equipped with cameras, sensors and vision systems are capable of handling sensitive and delicate materials with incredible accuracy and dexterity. "Our goal is fully automated production. A first step in this is to fit Robodrills with the automatically opening doors and FANUC robots to load and unload them." Automating labelling processes offers an easy cost-effective way of speeding up end of line processes. Whether it's product or carton labelling, every stage of the process from picking, orienting, placing to adding labels and sealing, can be completed by robots. Light and compact, FANUC LR Mate makes the perfect choice for these applications. Get your products sorted for delivery. 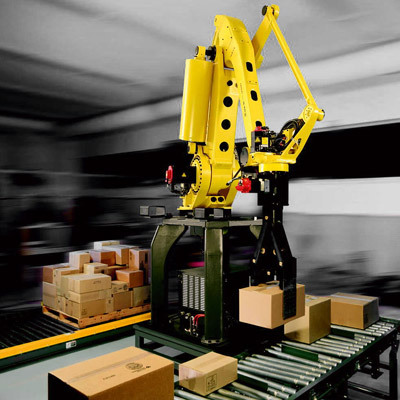 FANUC industrial robots can be equipped with a vision system and quick-change gripper that enables them to pack multiple products at once, accommodate a variety of container or box types and even insert layer separators.